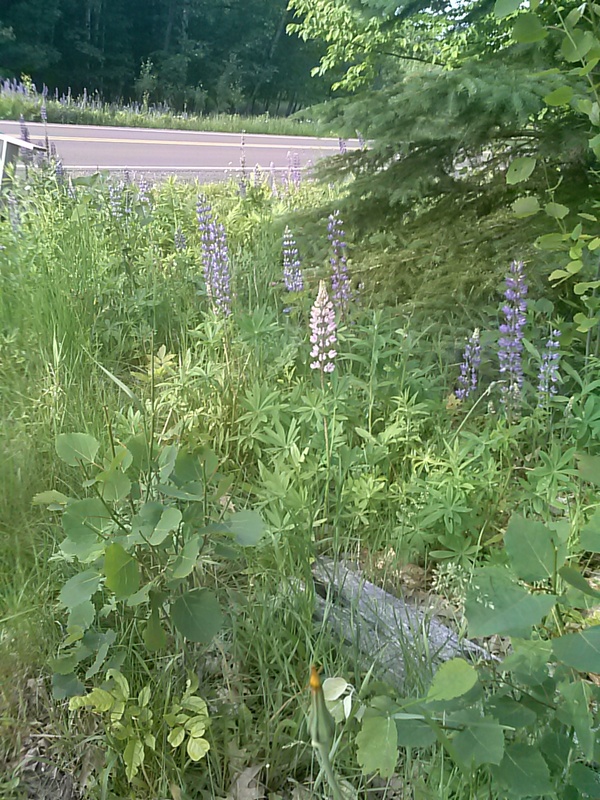 Lupines – we have these growing near our mailbox, and they are growing across the street as well. When I was a kid, there were some at only one tiny spot in the area I live in. Now they are in ditches along the road all over the place. 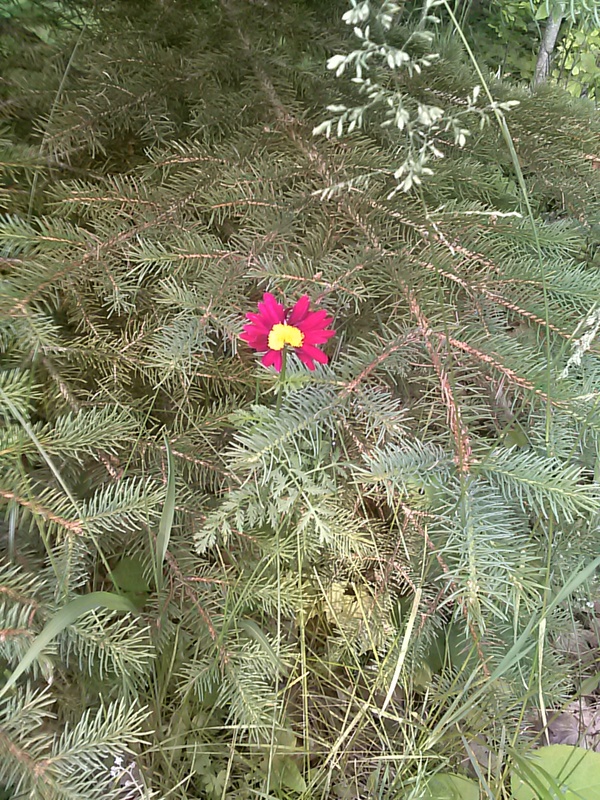 Here’s a new flower – I don’t remember these from last year. I don’t know what it is but it’s pretty. 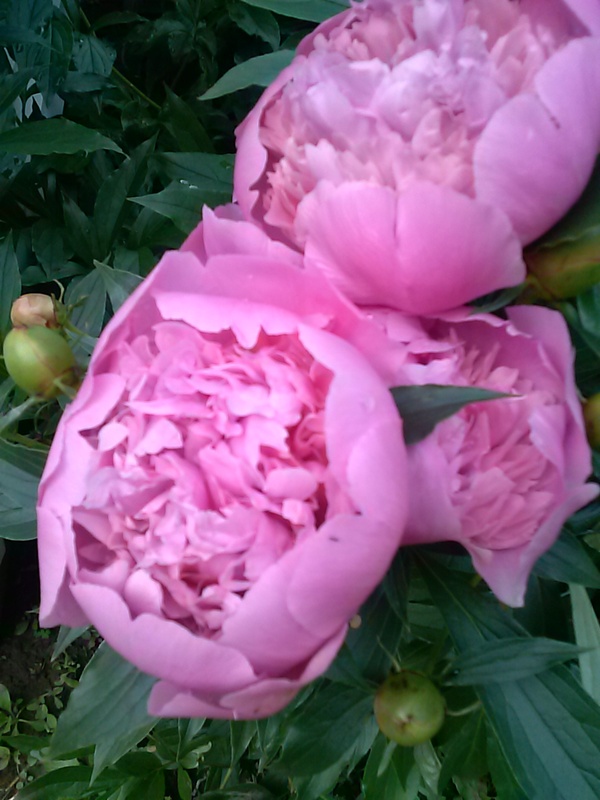 Our pink peonies. My parents planted these years ago and they are still going strong. These barrels are on our porch. Last year I tried to grow beets and carrots here, and nasturtiums. The Nasturtiums did ok, but my son found out they were edible and kept eating them. I planted a bunch of different flowers in them this year, along with some herbs. Here are some more barrels, just off our porch. 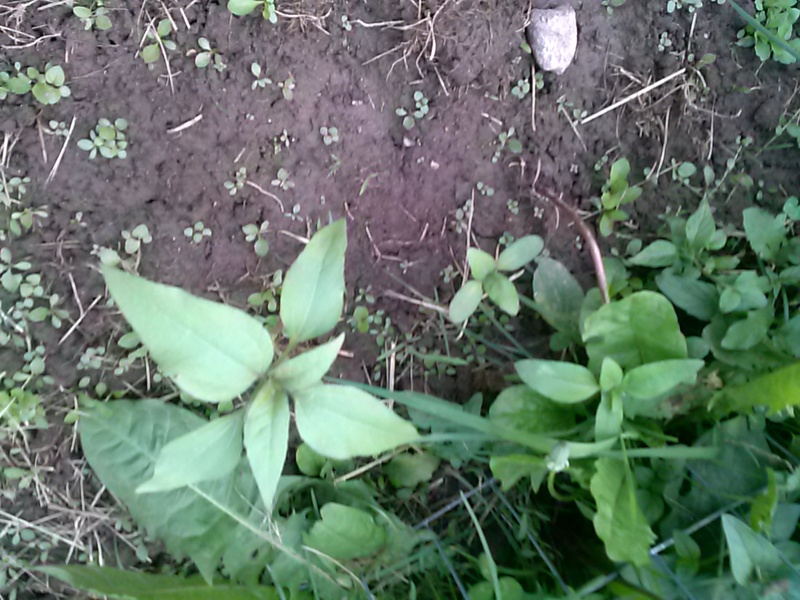 My mom planted lilies in them, and they’ve slowly stopped producing. We got one nice lily last year. 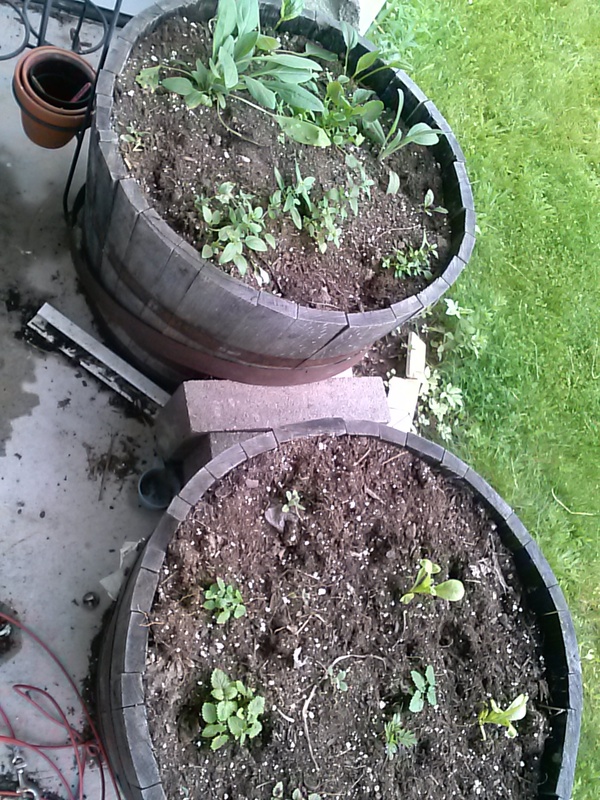 I divided them and put the big bulbs in only one barrel (the right one here) – there is also a yarrow growing in it; the left barrel has other flowers: Echinacea and black eyed susan and others. 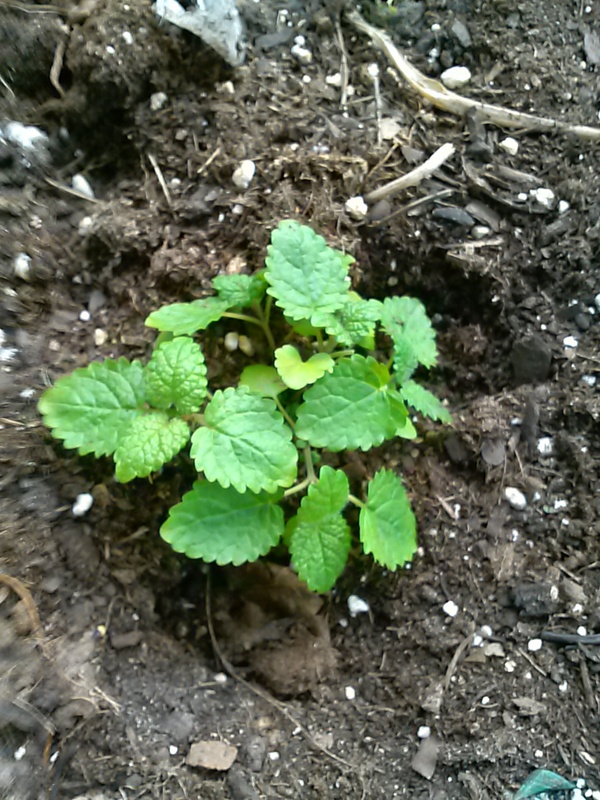 Here is some lemon balm growing in one of the barrels on the porch. It smells so good. 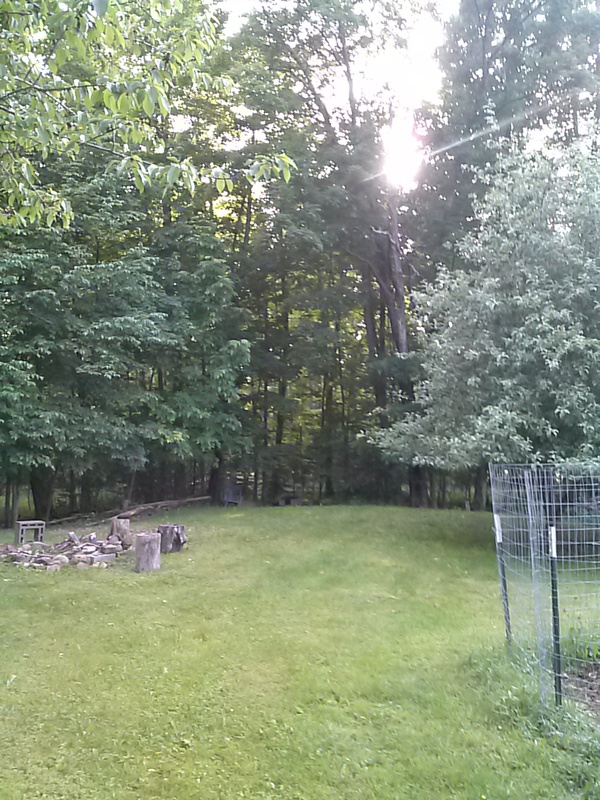 Here is our back yard. The leaves have filled out on the trees. 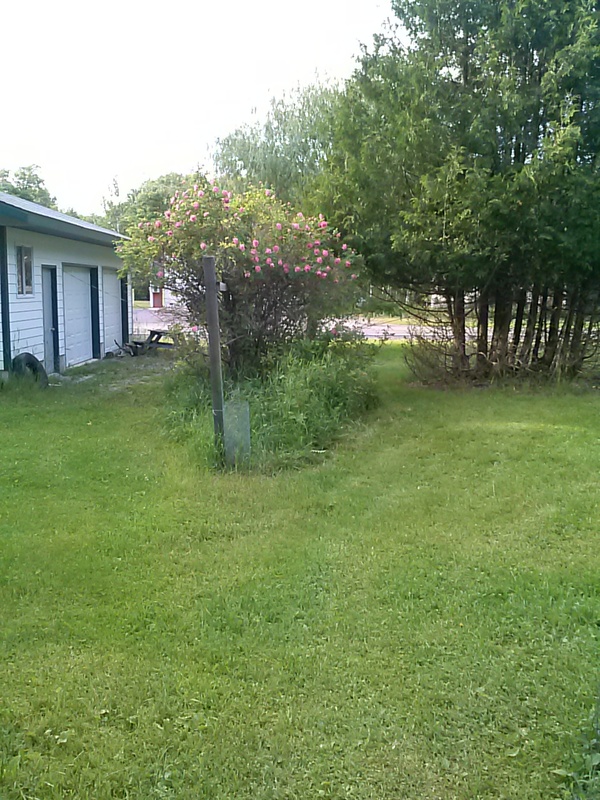 Our side yard with the rose bush. The roses are blooming now. At the nearest post, I have a wisteria planted. 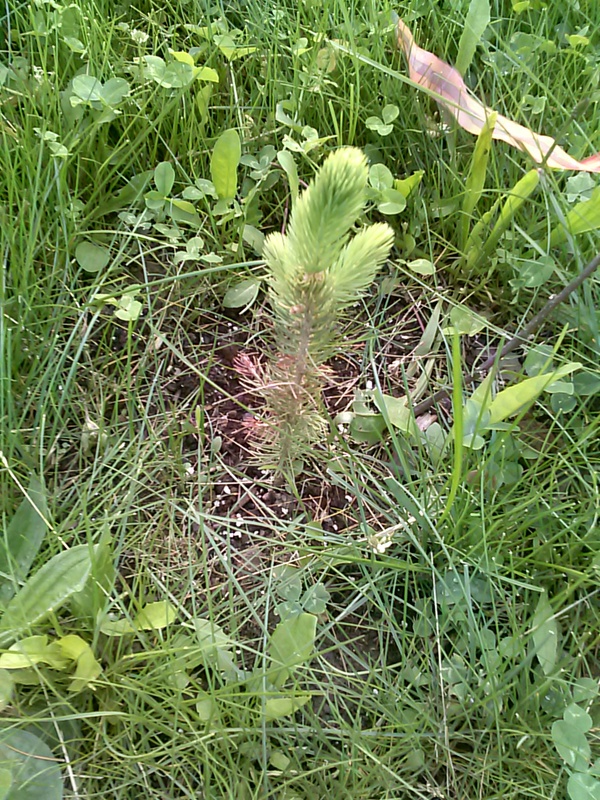 It’s about 5 inches tall, and doing well. It’s inside the little round cage you can see at the base of the post. I don’t know if deer eat wisteria, and don’t want to chance it. Some pretty flowers along our house. 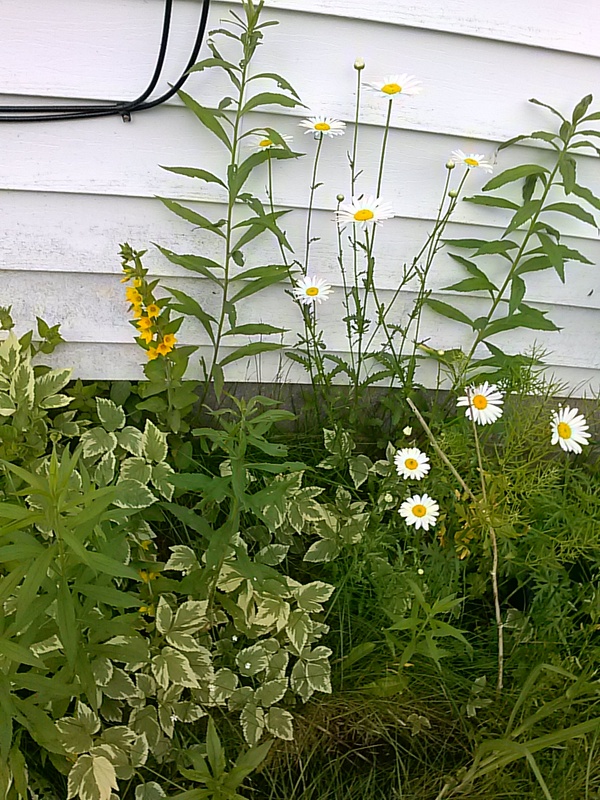 Wild Daisies and some kind of yellow flower – not sure if that was planted or if it’s wild. The white/green variegated leaf plants are “snow on the mountain” – they have taken over a lot of the flower beds and we are trying to eradicate it. It’s even growing at the edge of the woods now in spots. Here is my son’s tiny garden. He wanted his own space, so I gave him some seedlings to plant. He’s got tomatoes, brussel sprouts, and flowers. And Mint. He’s excited about the mint because he can eat it right from the garden. 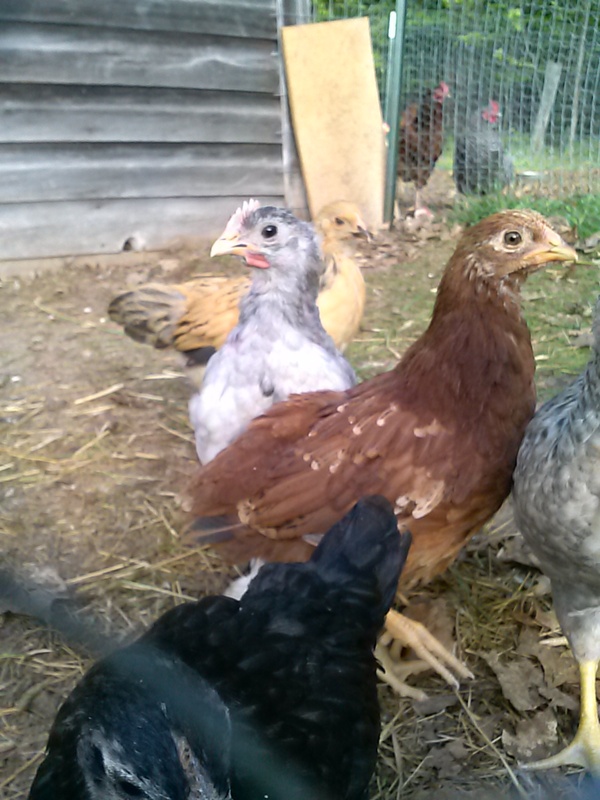 Here are my chickens in their muddy nasty run. I’m going to have to fix that, possibly sooner than I was planning. It’s driving me bananas. Hello! 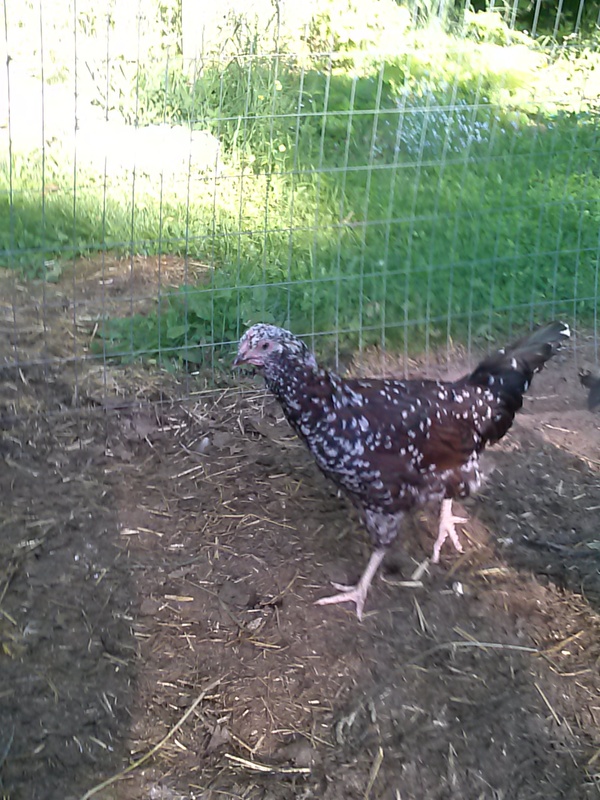 Here is one of my Brahma chicks. 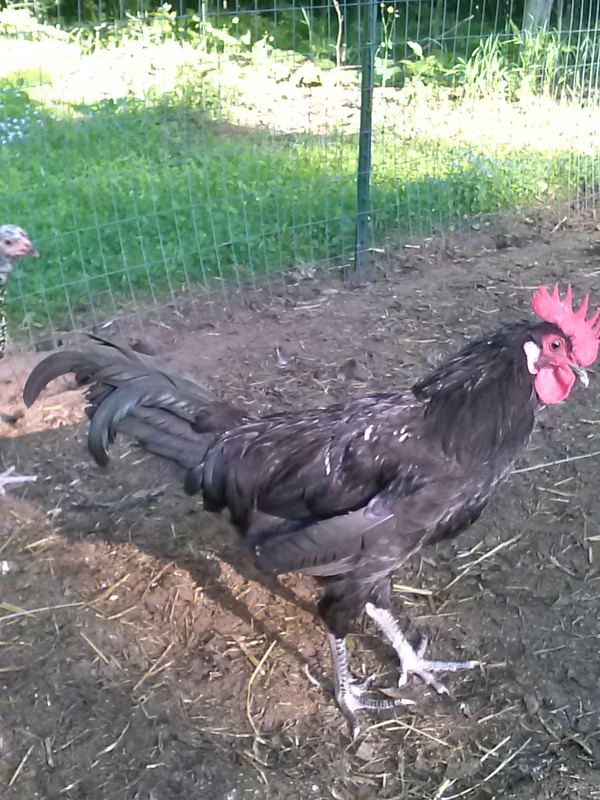 This is my tiny rooster. As he is growing, his comb is getting wonkier. The back portion is attached to his head off-center, which adds even more to the floppiness of it. He’s been really mean to the other chicks lately. Maybe they make fun of his goofy comb. 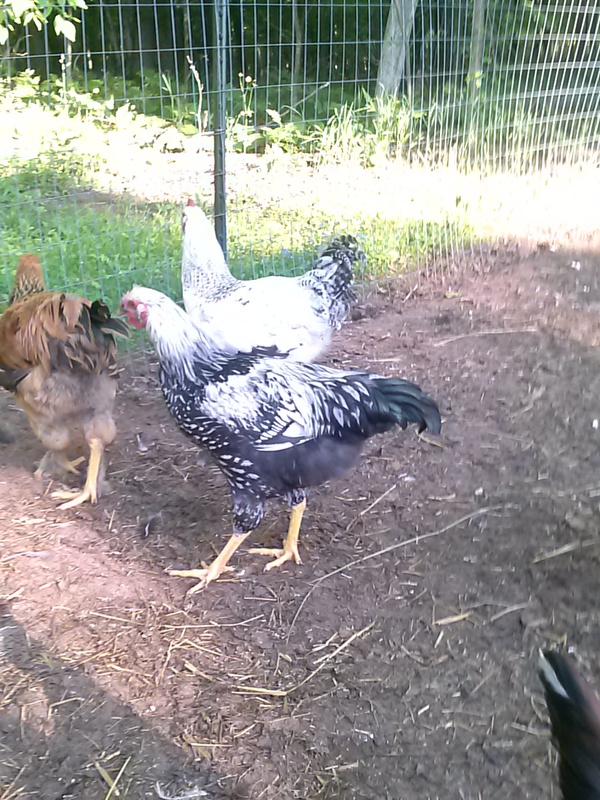 Here is my white brahma, which I actually think is a “Splash Brahma” – I love his/her coloring. 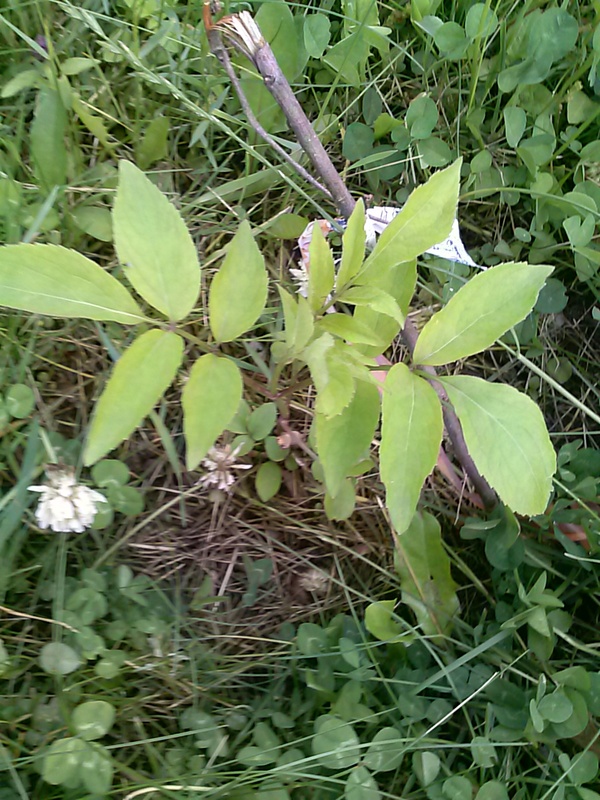 Here is one of my elderberry trees. I have two (you need two to get fruit so they can cross pollinate). I have put this near my blue spruce so that I actually get the screen I want in a more timely fashion. These are fast-growing. 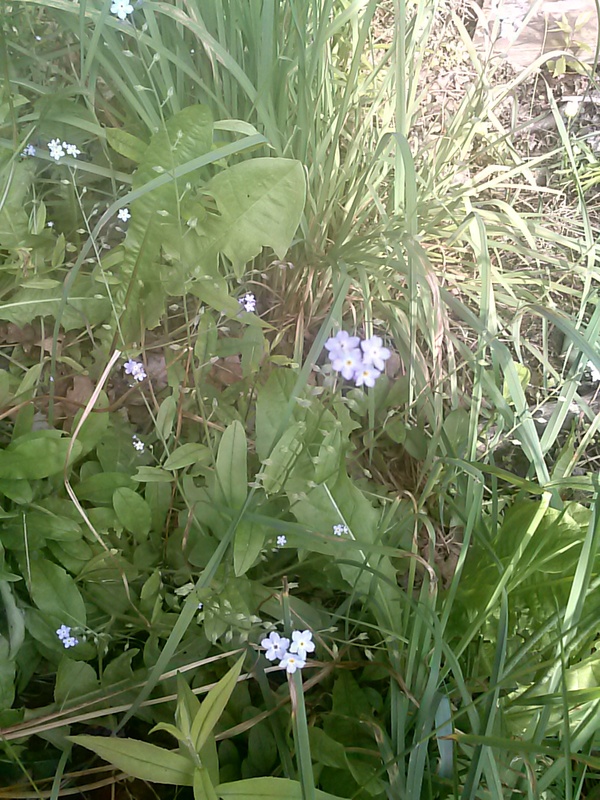 Here are some of the remaining forget-me-nots. 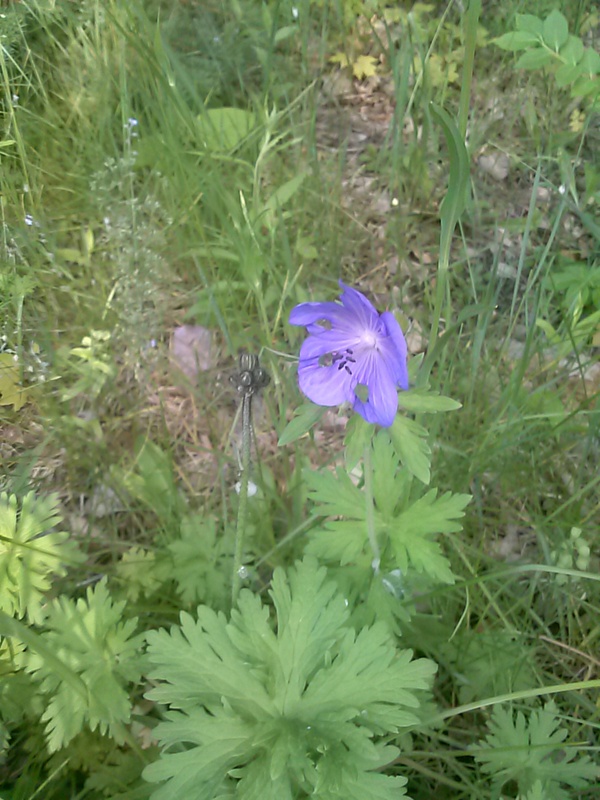 We had tons of these earlier in the year, as splashes of blue all around the woods and the edges of the yard. When I was a child, these only were growing at a camp two houses behind our house. I moved back and discovered they grow all over our yard now. 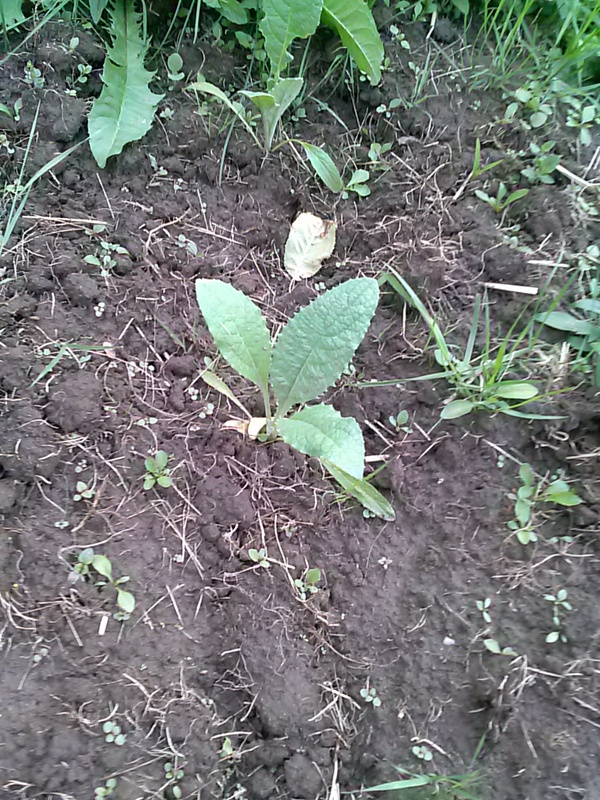 Here is a giant mullein plant growing in our supposed-to-be asparagus patch. 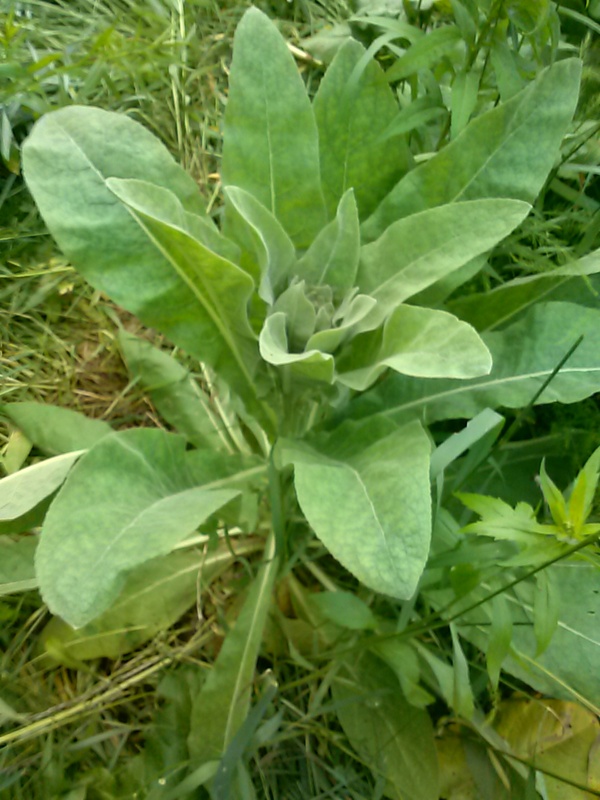 Mullein is a great medicinal plant so I’m letting it stay. This thing is about 3 feet tall right now. The big leaves are 1 ft long. I hope you enjoyed my photo tour. I like my yard, and watching the changes it goes through during the warm months. My back garden, which I increased in size from last year, is doing ok. I have a lot of things growing in it, most of which was not what I planted. 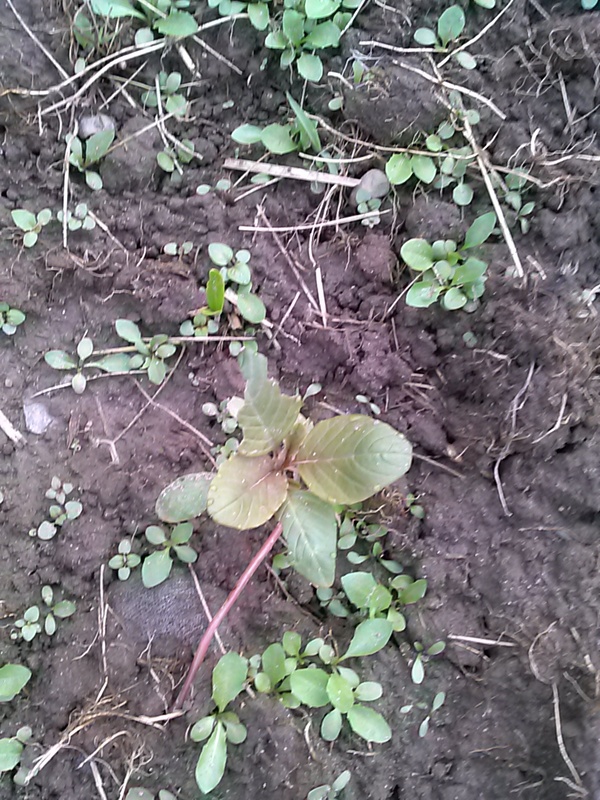 I have a lot of weeds, but luckily they are mostly lamb’s quarters, which are edible and actually really delicious (they taste kind of like spinach). I liked the few we found last year so much that I bought seeds for this year, and then didn’t have to plant any – they grew on their own. Here are some photos of my back garden plot. 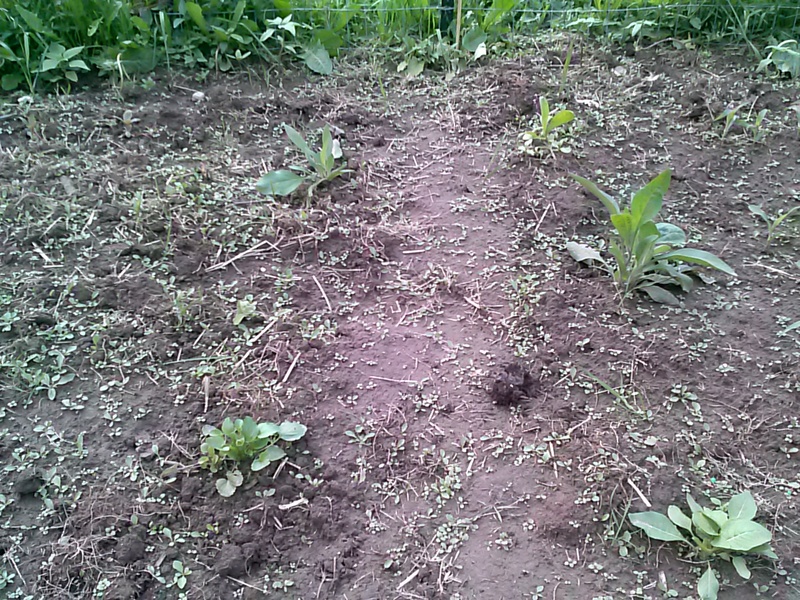 Here is the bed that is mostly full of lamb’s quarters. I am going to let them grow a bit more before harvesting. 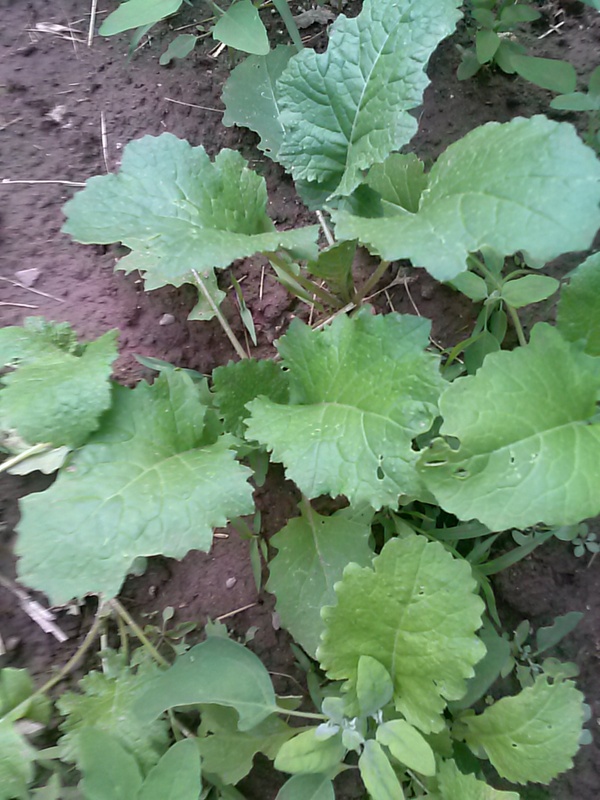 I have some stuff I planted that is (kind of) growing in amongst all the lamb’s quarters. This should be Kale, beets, onions, and carrots. Here are some of my turnips. 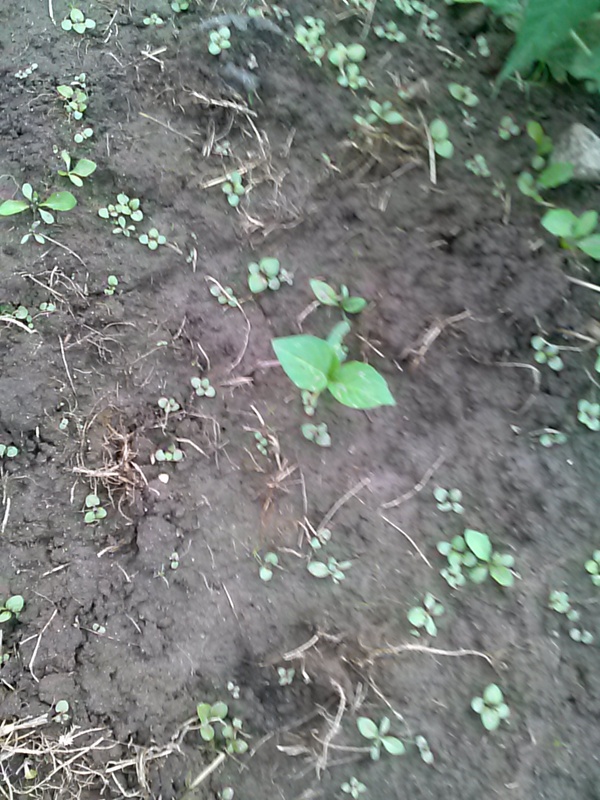 I planted a couple of small rows and they actually all seem to have sprouted, and are doing well. I like turnips when they are smallish – we cook them in butter. I haven’t had them in several years, but, yum. 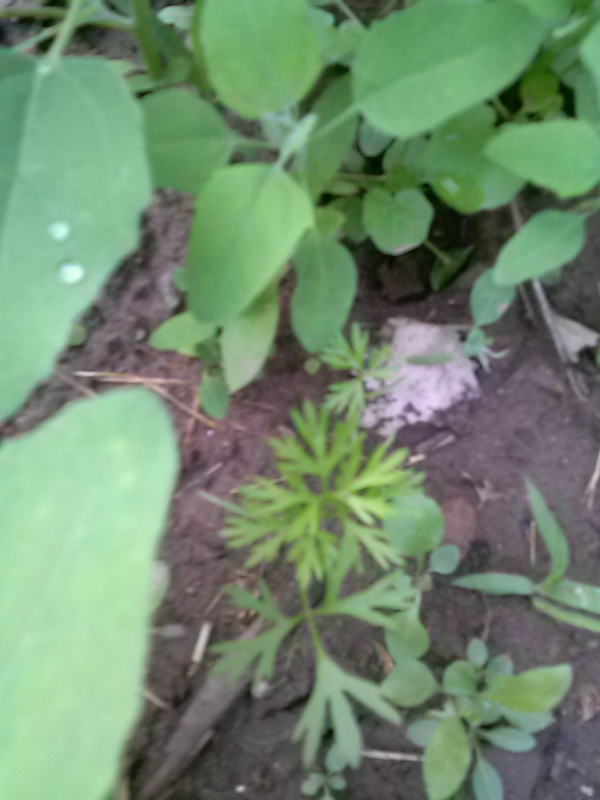 I think I have found four carrots in amongst the lamb’s quarters. 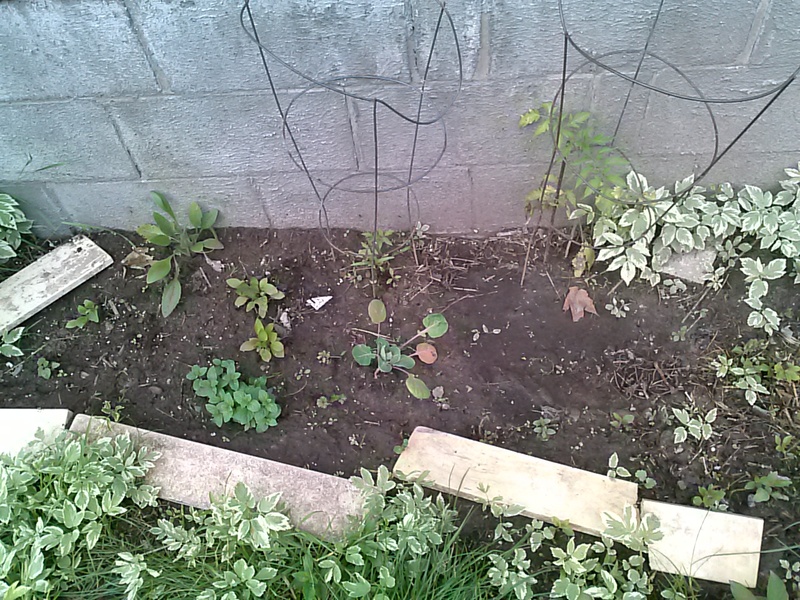 I have replanted more seeds so hopefully here soon we will see more. Here is one of the four I have found. I might have a few onions, I planted a couple rows originally but have only found a couple. Here is one of them. I replanted seeds again this week so should see more soon, hopefully. 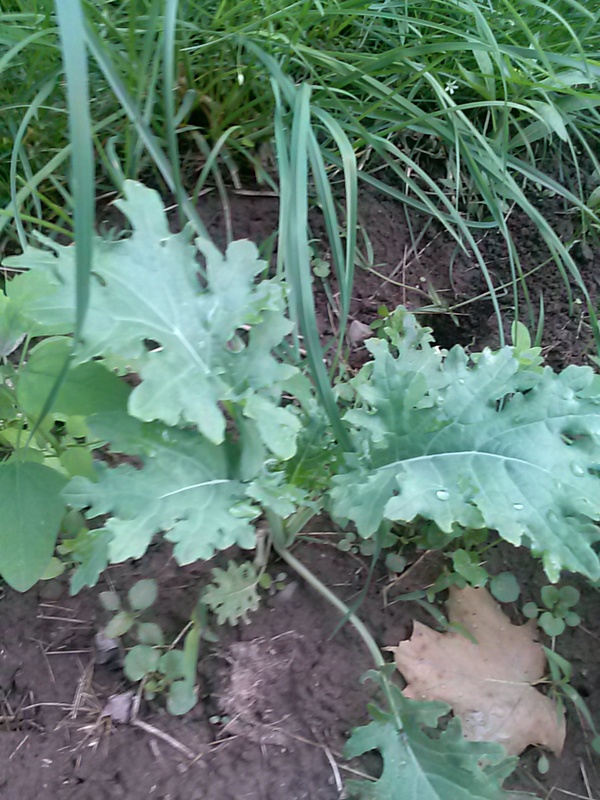 Here is my kale. I grew these inside at first as seedlings and then planted about 20 of them in the garden. I think most of them have survived, and are doing well. The leaves on this one are about 5 inches long. I planted a little raised area next to my strawberry patch (which is also in the back garden plot) with chard, lettuce, and spinach. 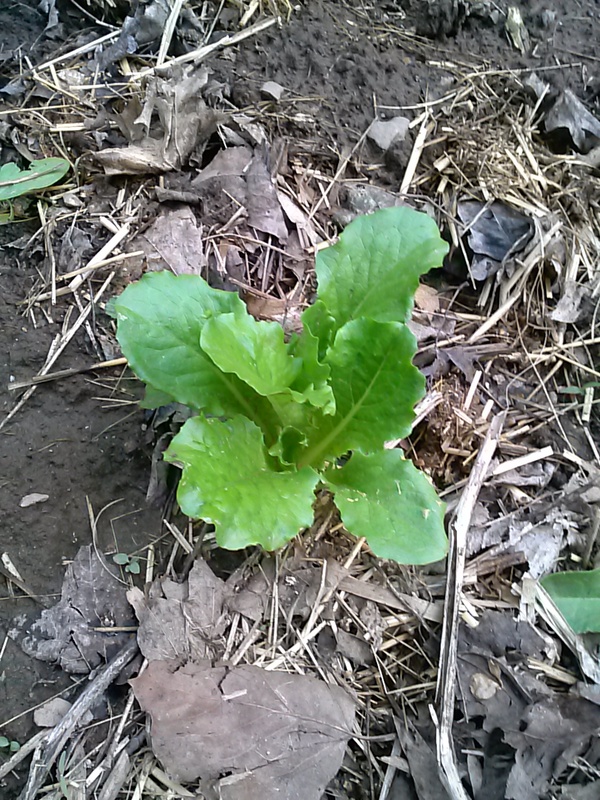 Here is my romaine. I put seedlings in and most are still there and doing well. 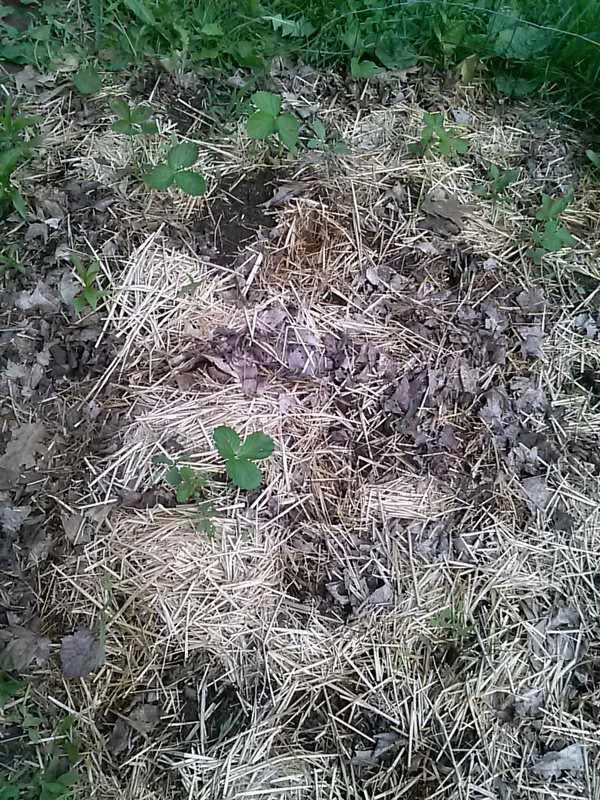 This is part of my strawberry patch. 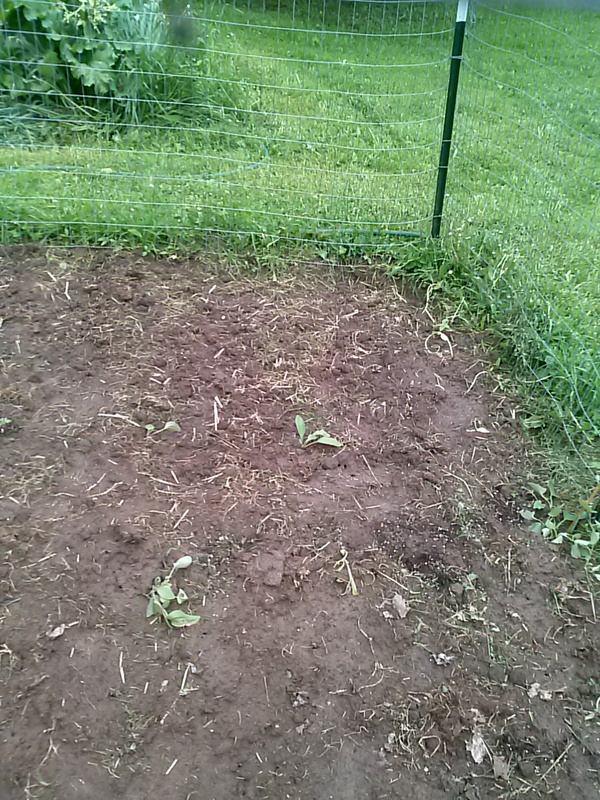 I’m not too impressed – this year I planted 25 plants into a “lasagna” garden. I have maybe 10 that survived. I figure if they all make it I will adjust their positions and let them fill the garden in, instead of buying more plants next year. These are starting to get flowers on some of the plants. Here are some of my brussel sprouts. They are doing good. 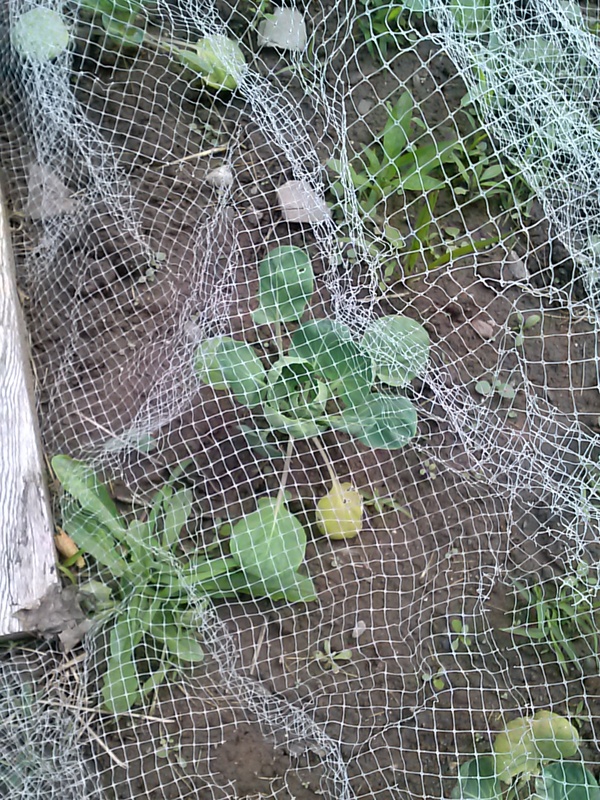 I have netting over them to prevent stupid cabbage moths from laying eggs. They decimated my cabbage last year. 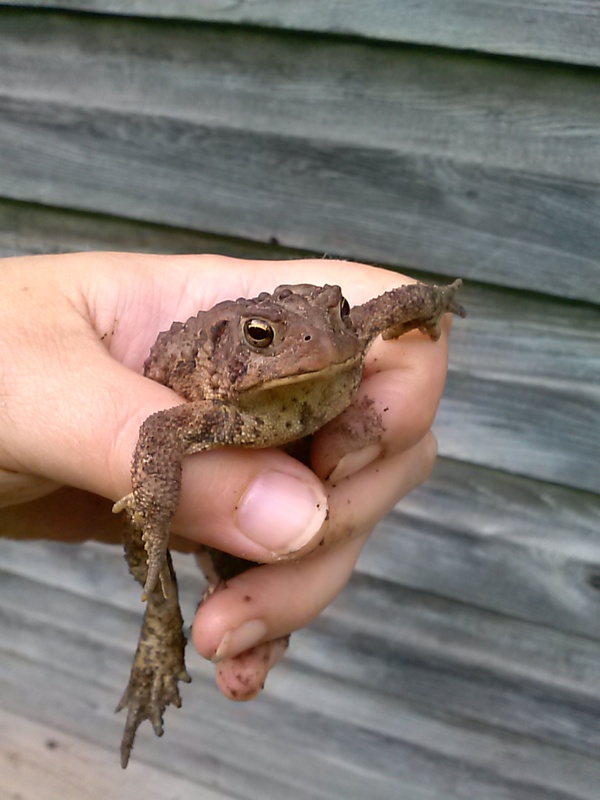 Here is a toad that I keep running into in the back garden. I think he lives there, which makes me happy. They eat lots of bugs. He must get scared each time I come into the garden because he always hops which makes me see him. If he just hid I wouldn’t know he was there. The other night it was going to storm. It was the second time I’d run into Mr. Toad. 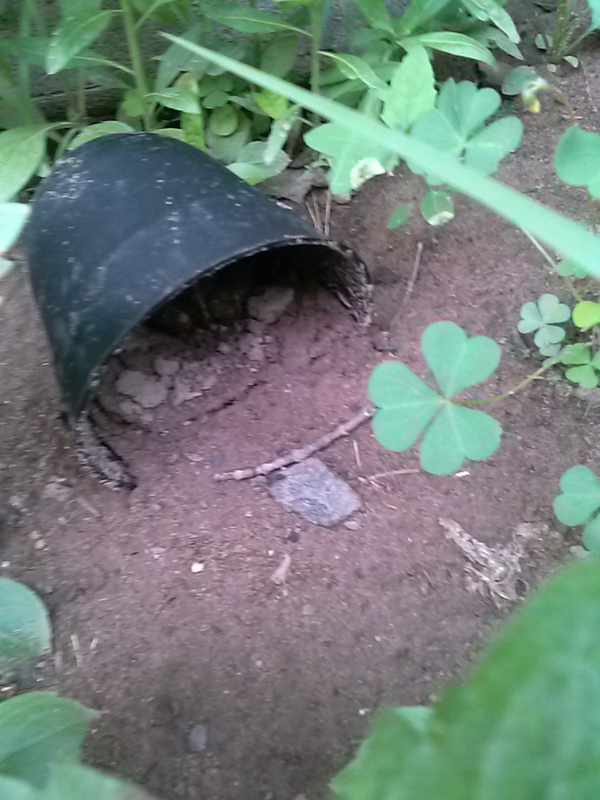 So I found a flower pot and made him a makeshift toad house. The plants aren’t really big enough to give him any shelter yet. I put him inside, and I saw him in there later on, looking out, like he liked his house. I haven’t posted in a bit, I’ve been really busy… and we’ve had a ton of rain. The garden is doing ok, things are growing slowly, and my seeds (and second sets of seeds I had to plant) are sprouting, mostly. 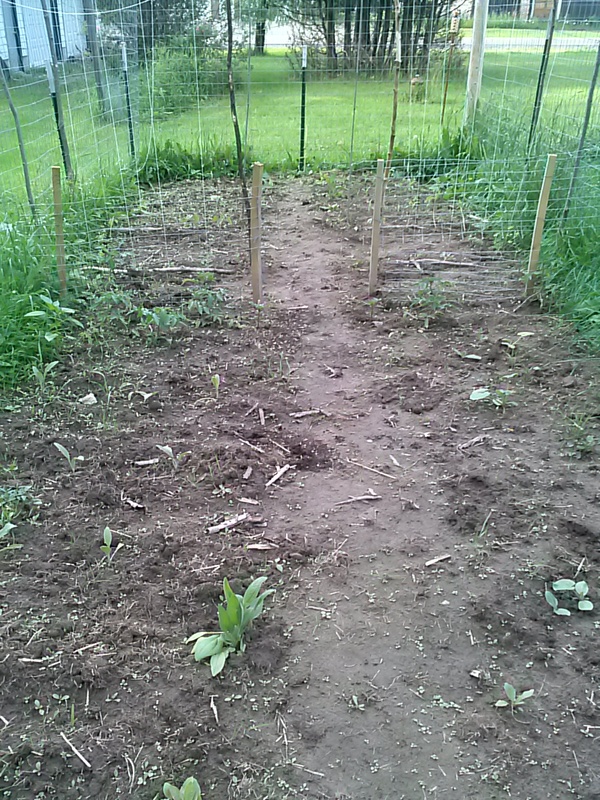 I planted two types of corn, on either side of the garden. 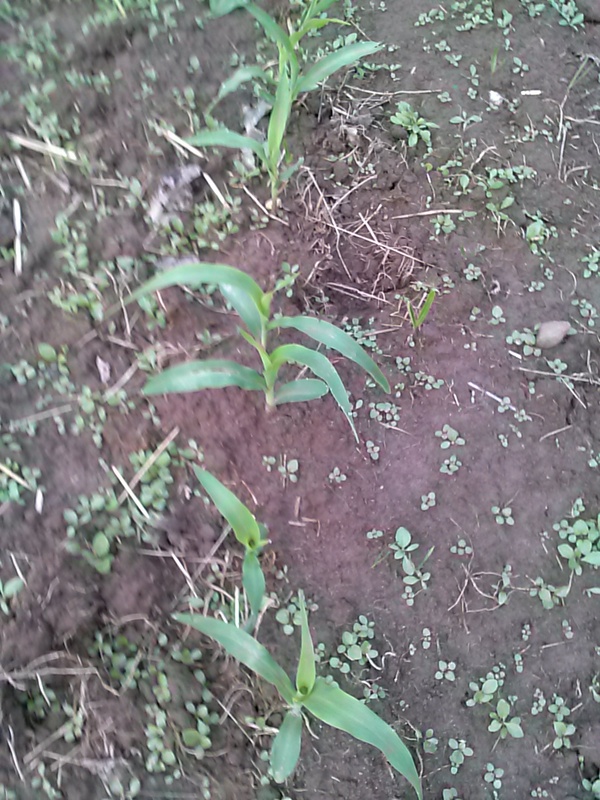 The yellow corn I planted has sprouted, the plants are about 2 inches tall. I got maybe a 70% sprout rate though. My white corn has done nothing that I can see. The seeds were packed for 2014 so that may be the problem. I plan on adding more yellow corn seeds soon. I had to replant seeds for cucumber, and some for zucchini. 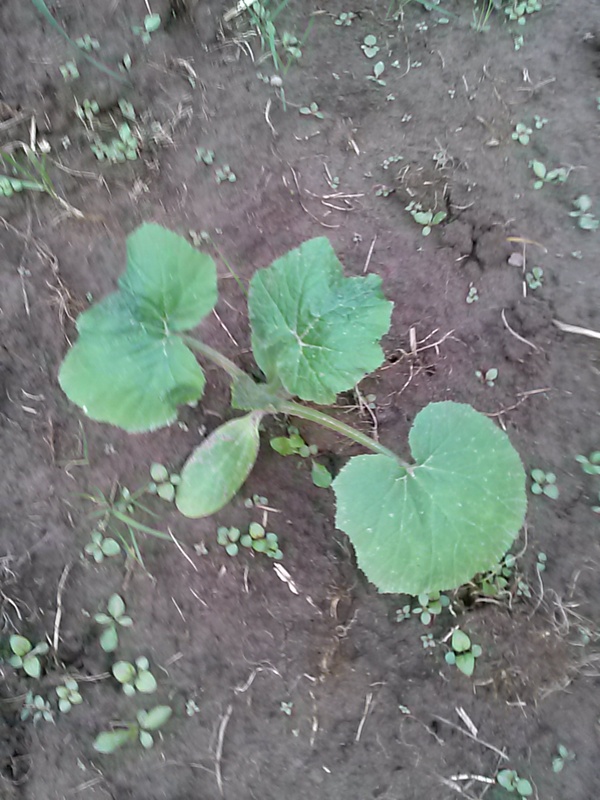 I don’t know if they damped off when the seedlings were put in, but the original cucumber seedlings had all died and I have one original zucchini; I had put in 4 seedlings. So I added new seeds; They are now sprouting. 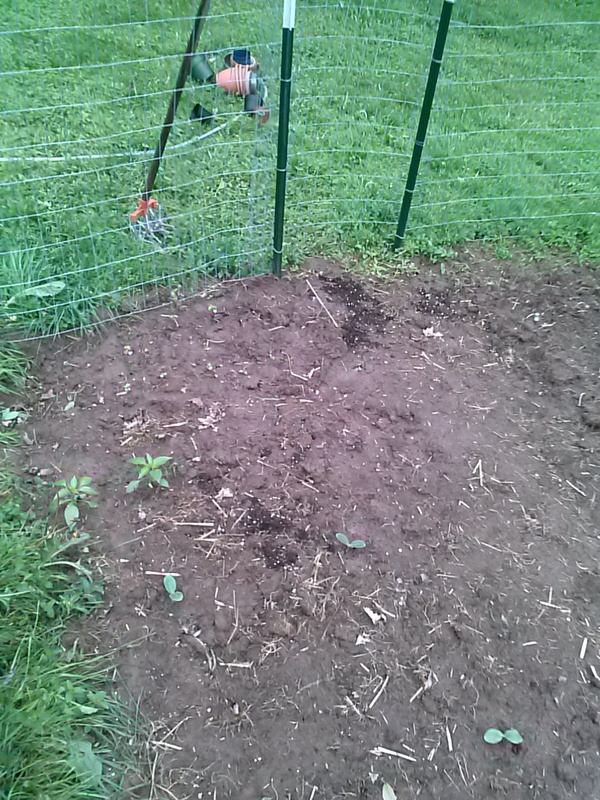 I planted some rows of onions, carrots, beets, and turnips. 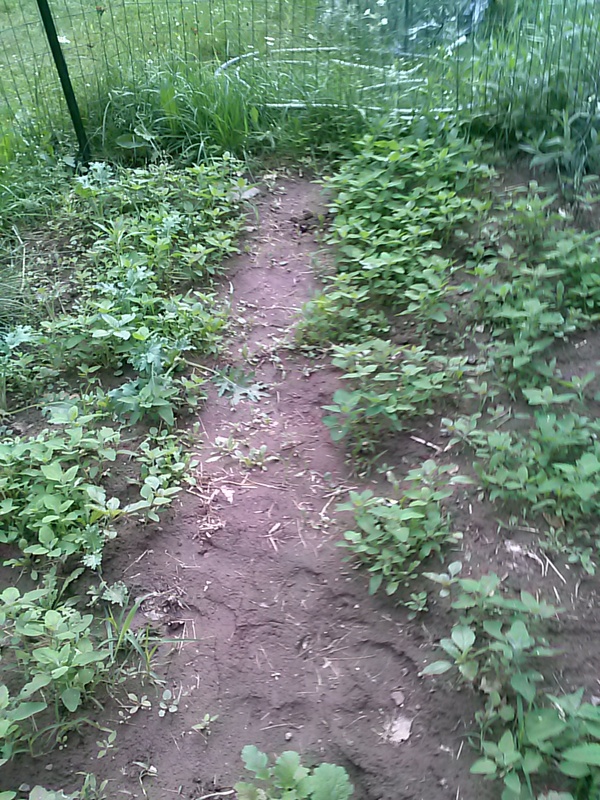 In that garden, I have a TON of lamb’s quarters (weeds), which are actually really tasty so that is ok. I have a bunch of turnips. I think I have one or 2 onions coming up, and 5 or 6 carrots, and 3 or 4 beets. I will add more seeds for those this week. I’m not sure what happened to those. 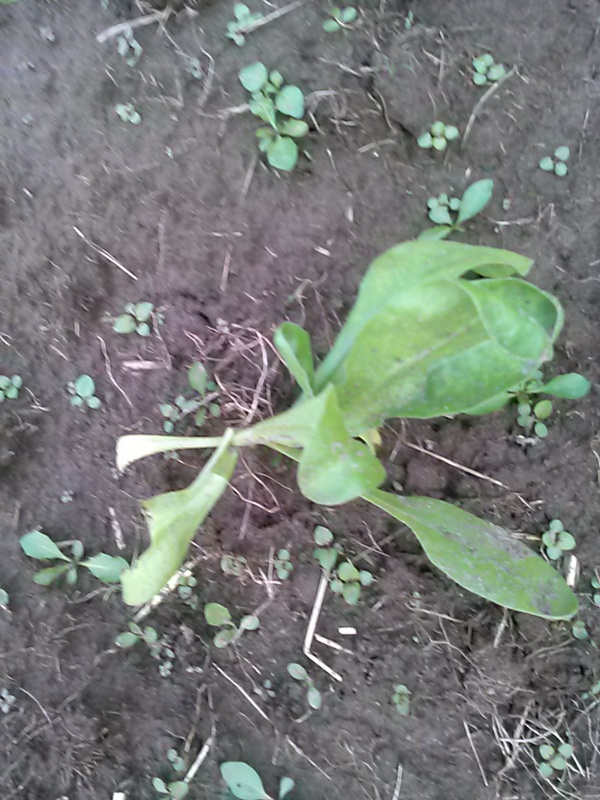 I did notice a beet growing in my pathway, so the seeds must have gotten washed away somewhat. We have had a lot of rain. It rains almost daily, and our temps have been in the 60s or so, sometimes into the 70s, but still not as warm as it could be. The rains aren’t very warm rains either. The garden is trudging along. It will do better as we get a lot more sun. 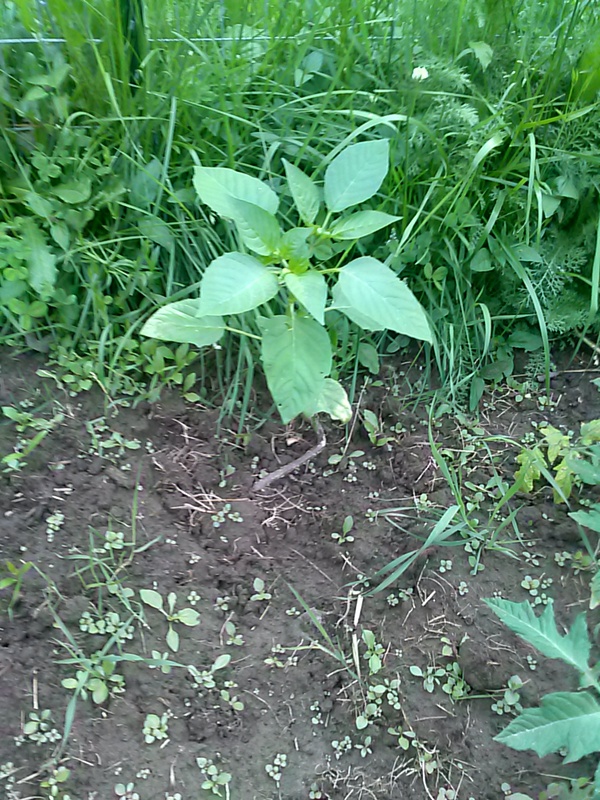 My sunflowers are doing ok too, so that makes me really happy. I haven’t had a sunflower grow for me at this house. 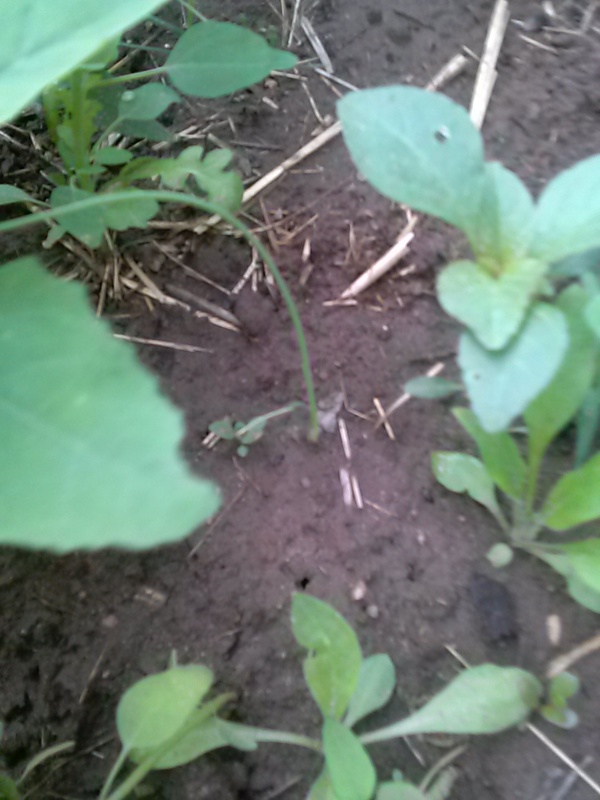 Last year I lost every one I planted to deer. This year they are planted inside my fence. 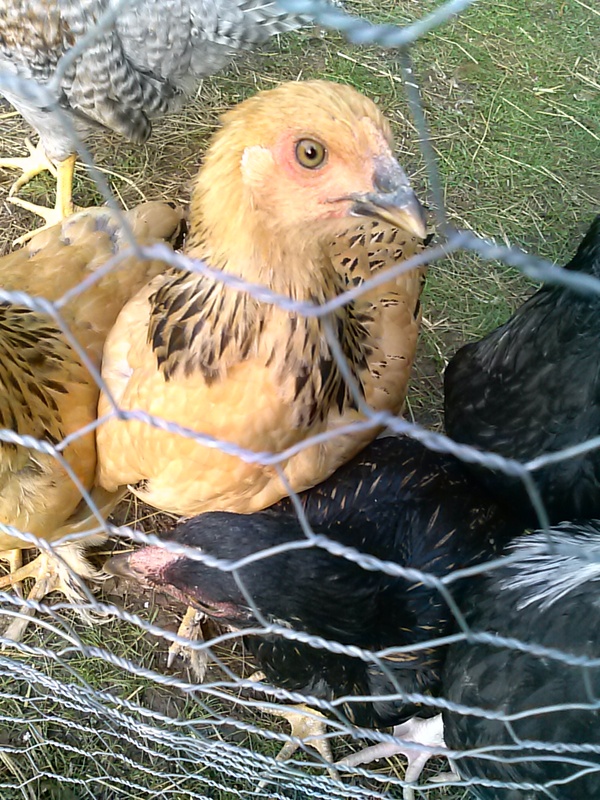 Last week, I got home and the chickens were mixed together. From my driveway I can see the babies’ little run. I parked and saw adult chickens in there. I went to see what was going on, and somehow the door that divides their coop space (inside the coop) was left open, so the adults and teens (which are pretty much adults now) were all over in the chicks’ area, and my chicks were scattered. 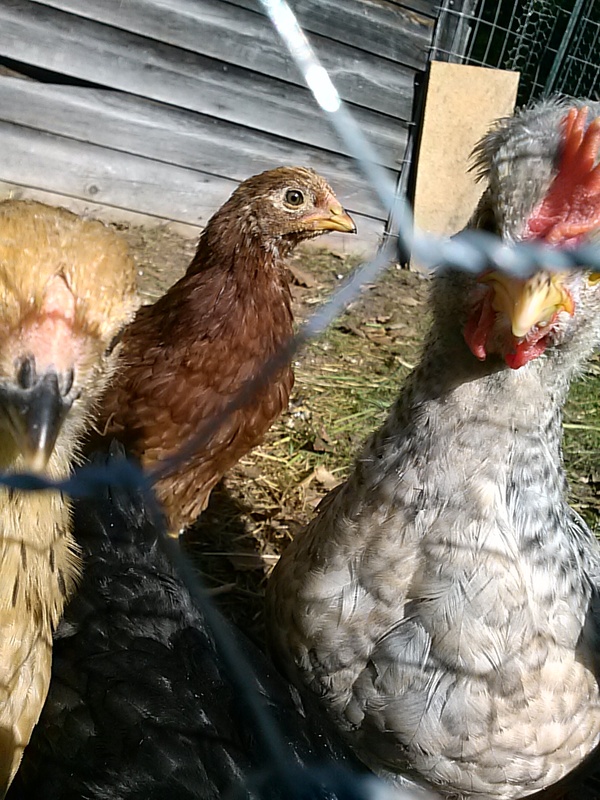 There were 3 huddled in a corner, one hiding behind a food bag, and the rest were outside hiding behind the coop. The adults scratched up the chicks’ run, so it’s a lot more muddy now than it had been. 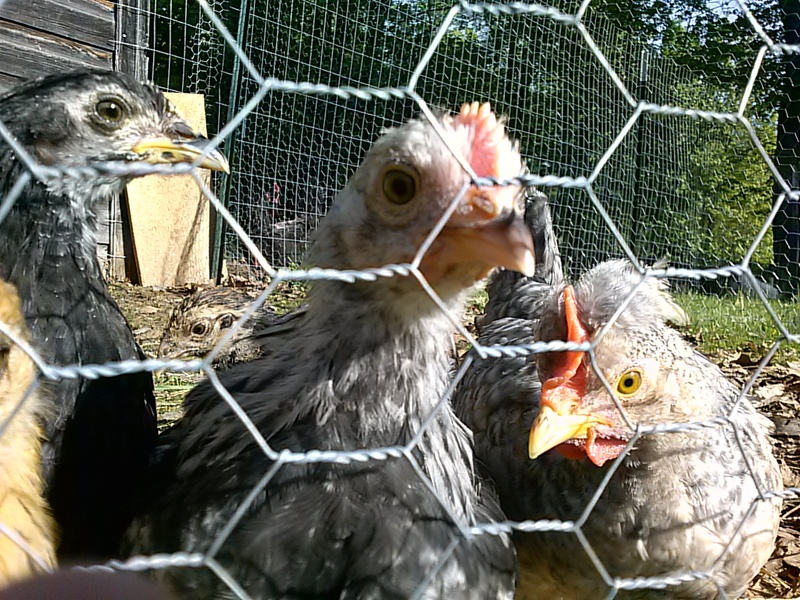 I got them all sorted out, and we’re making absolutely sure that we lock the inside coop door, so that it doesn’t happen again. 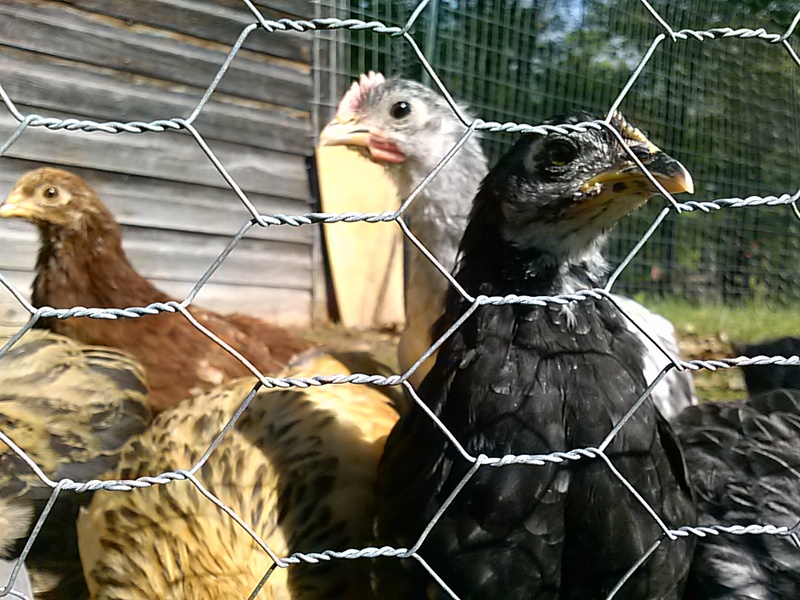 As soon as the chicks are 3 months old, around July 20th, I am going to integrate them together. I cannot wait! 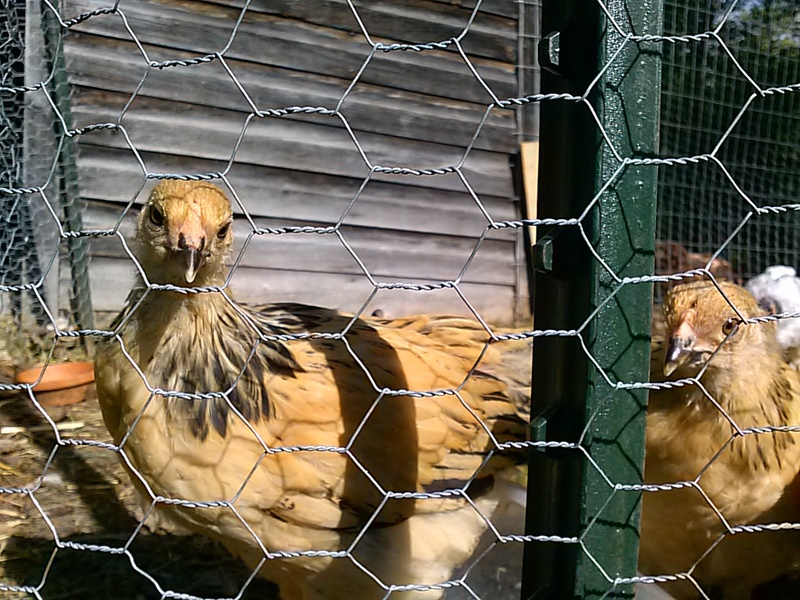 The reason for this, is that our current adult chicken run is a disgusting muddy mess. We are going to add a second fenced-in run area, an area which currently has grass, and then integrate everyone into that run. We’ll then cut off their access to the current run, so that we can fix the mud problem. I would also like to plant it with some chicken edibles, so they have stuff to munch on over there. The muddiest spot is right at the door from the coop to the run, so we need to figure out what to do there – maybe put some kind of patio (brick/concrete) there so that it doesn’t turn to mud as soon as it rains. 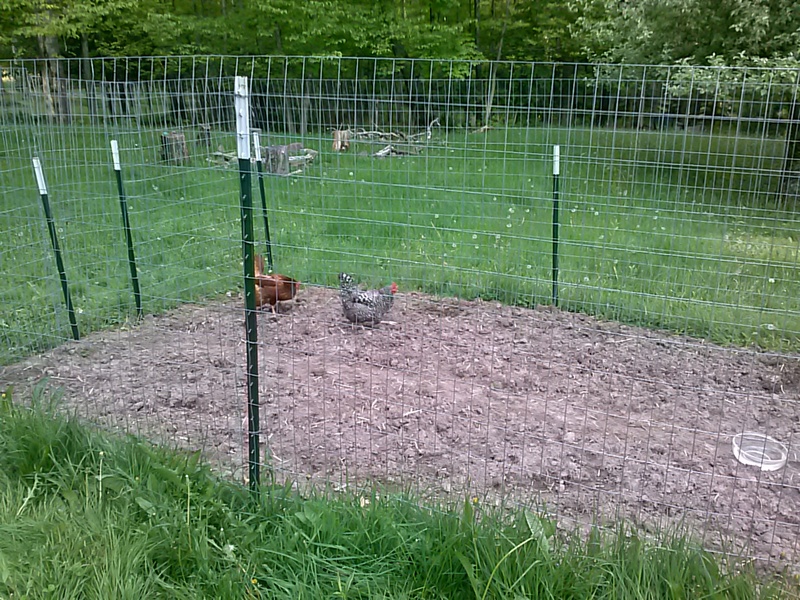 Once everything on that side is fixed and plants are growing, I will start cycling the chickens between runs – so they can eat down one side while the other side is growing, and then we’ll switch them to the new grown stuff, and so on. With all our rain, the run doesn’t dry very well, or for very long, and then the teens don’t like to go to bed at night when I put them in, so it takes awhile to get them all in, and we end up trudging through mud, and they all have muddy feet, and it’s disgusting. I do lure them in to the coop with treats, but I have to wait until they are all in and the door is shut, or they take their treats and run outside; then I have to chase them in. Ahh… chickens. Yay! The garden is in! I planted my new garden yesterday. Most of the plants are looking a little sad today, since we got rain last night. I think they’re fine and will perk up once we get some more sun. I’ve got lots of vegetables, with some flowers interspersed along the middle pathway. I ran out of room for my herbs because I wanted to grow various kinds of squash – zucchini, yellow squash, acorn, and butternut. 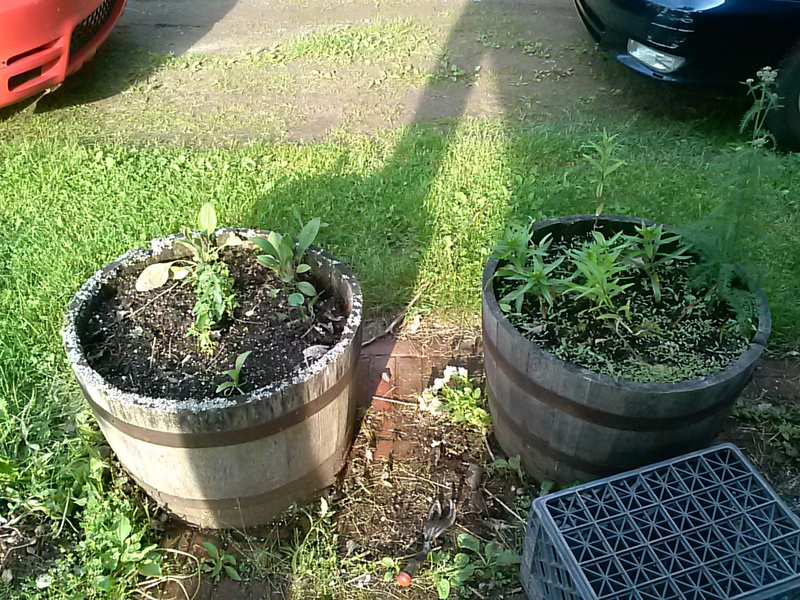 I ended up with two small rows of mixed herbs – basil, rosemary, cayenne, lemon balm. (I meant to make a separate herb bed, but this new garden took up most of my energy this year). 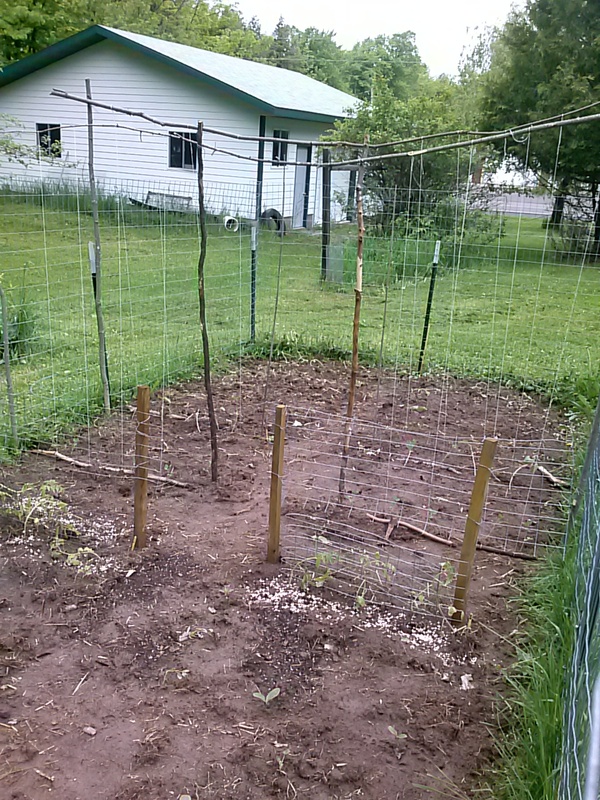 Instead of tomato cages I decided to use some leftover fencing attached to poles, and will attach the tomato plants to them as they grow. 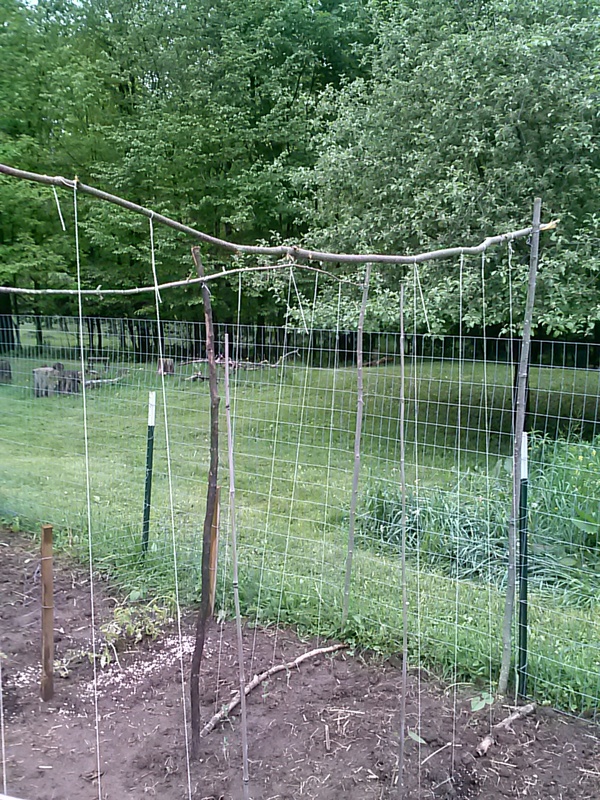 I made some supports for my beans and peas using saplings and string. I pounded the saplings in like fence posts, and then wire was used to hold the saplings together and to attach them to the fence. 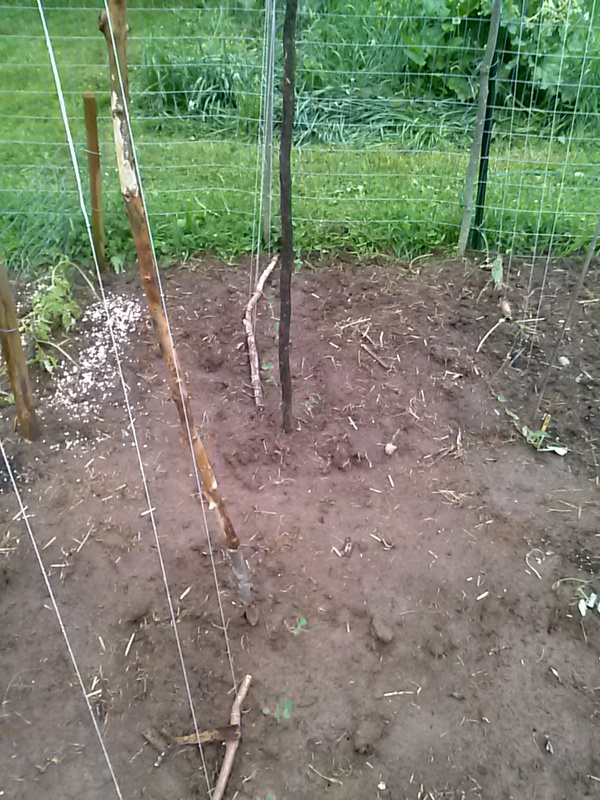 The top poles are from the top of the saplings, and attached to the poles with wire. 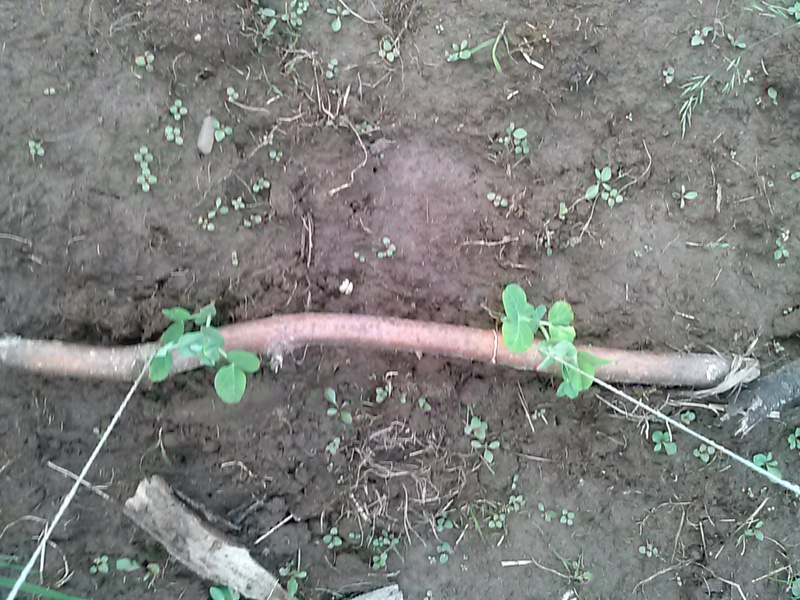 I then tied string and attached it to sticks at the bottom where the peas and beans are planted. This is the corn patch. I have yellow and white corn seeds planted. I have sunflowers on the right, next to the fence, and some flowers along the path. I realized I had started way too many plants. I had overestimated the amount of space I had. I also didn’t figure I’d get as good of a germ-rate as I did for some things. Next year I won’t start as many plants, and I won’t start them so early. The April-started plants were ok, but I think it would have been better to start them in May. My tomatoes were no longer happy in the pots they were in – hopefully they will be happier now that they are in the garden. The garden looks pretty sparse now, but as things grow and fill in, it should look really nice. 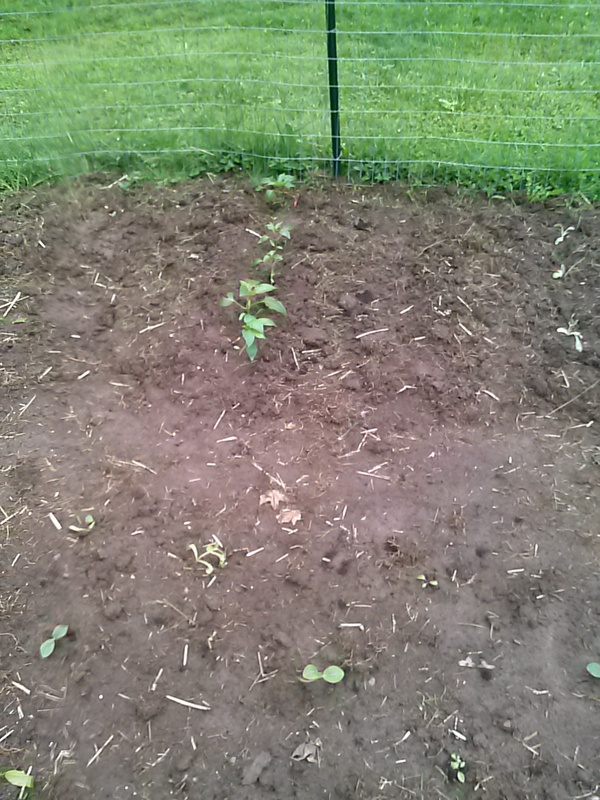 I also planted some spinach and chard, and kale in my older garden bed behind the house. I had started carrots, beets, onions, and turnips a couple weeks ago, and some are starting to show up through the soil now. I put some of my chickens to work today. My garden is just sitting, waiting for me to start planting this coming weekend when I have time. I want to get all the plants in at once. 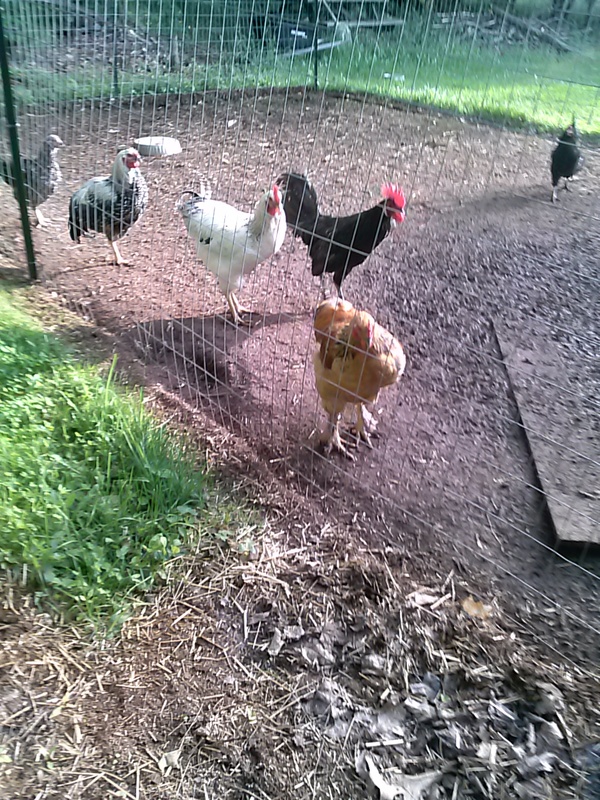 I decided to put a few chickens in there today, to scratch around and get any bugs out, and also to eat some of the grass that is at the fence line. 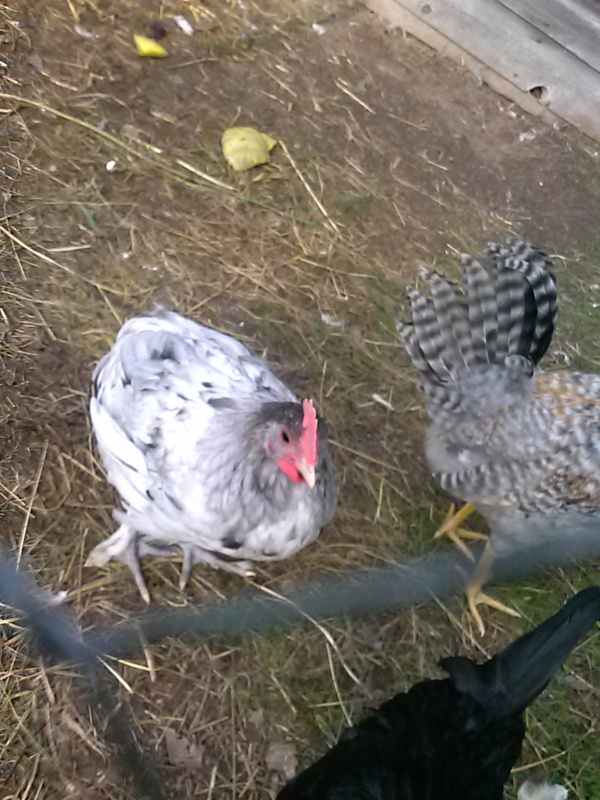 Here are a couple chickens scratching in the garden. 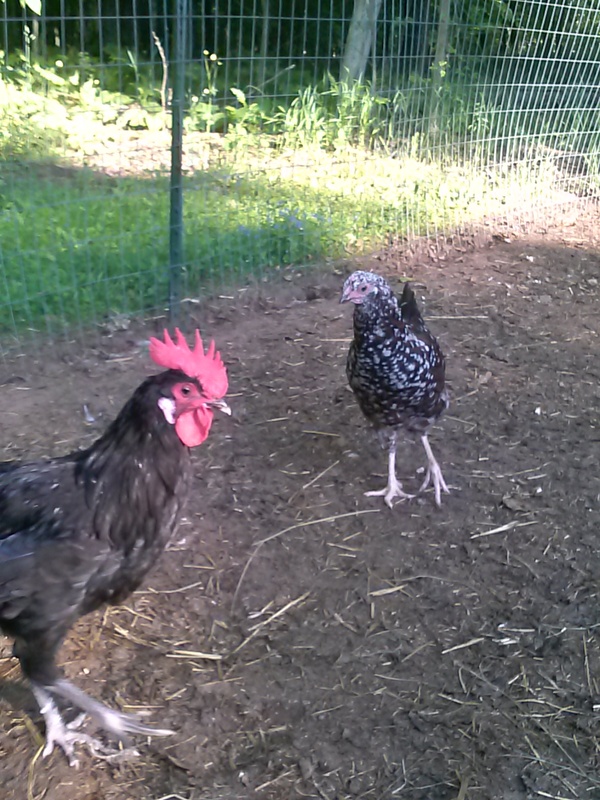 I chose to use some of my adult hens because I figured they may be more efficient, and also I didn’t want to cause any kind of anxiety issues with the teenager chickens. I thought that taking them out and then putting them back in the coop later may cause them unneeded anxiety, but that my adults would be able to handle it since they’re top of the pecking order. We put four hens in the garden in the morning before I left for work, with a little shelter made out of large flower pots and a piece of wood, in case they needed to get out of the sun. 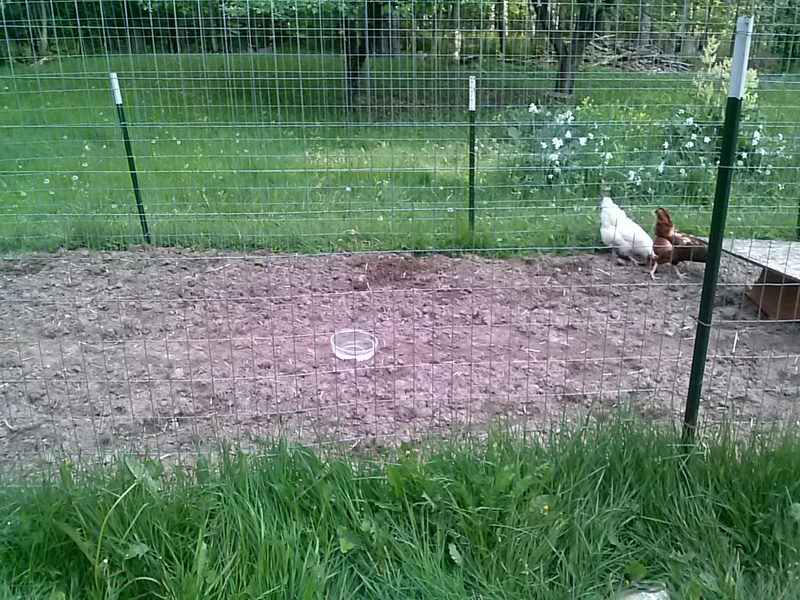 Chickens in the garden – the little bowl here is for water for them. 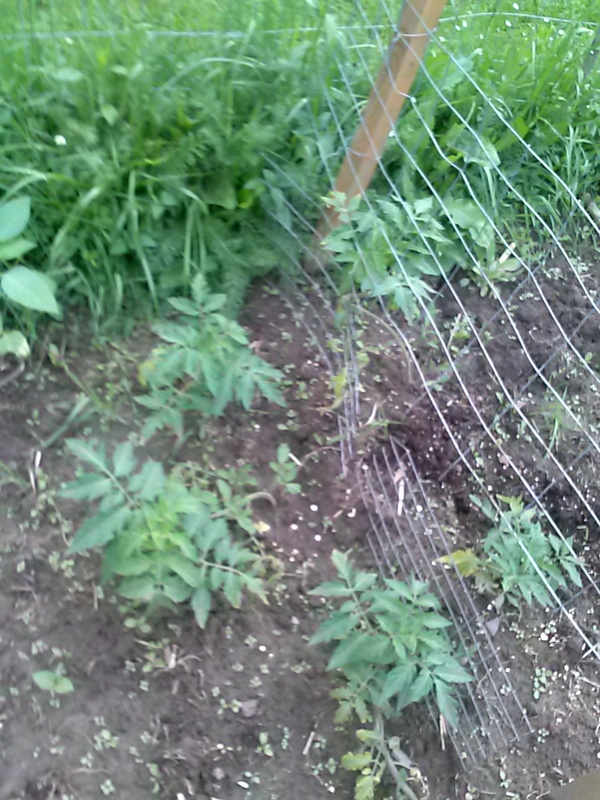 My ladies did a good job – my garden seemed quite picked over; I could tell that they had scratched most of it up. I had made a pushed-down “trail” going through the middle, which will be my pathway, and that was completely gone by the time I got home. I could tell the grass at the fence line was a lot smaller as well. The garden space is right next to our dog run. 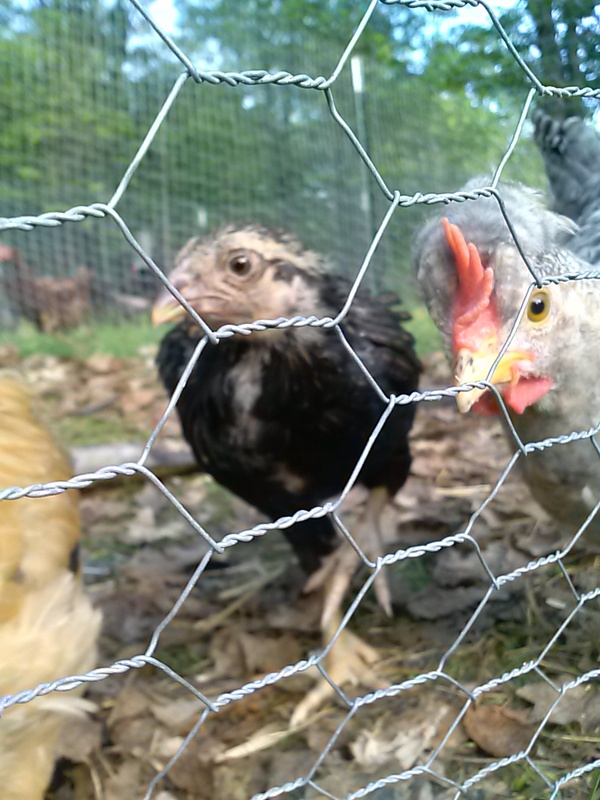 At first the hens were very scared when Atat ran out to see what they were doing. Downey was interested but not as playful as Atat. Atat ran up and started running up and down the fence line, and the chickens ran away back and forth from him, and then finally bundled up in the corner for awhile, till he went back inside. Atat checking out the chickens. 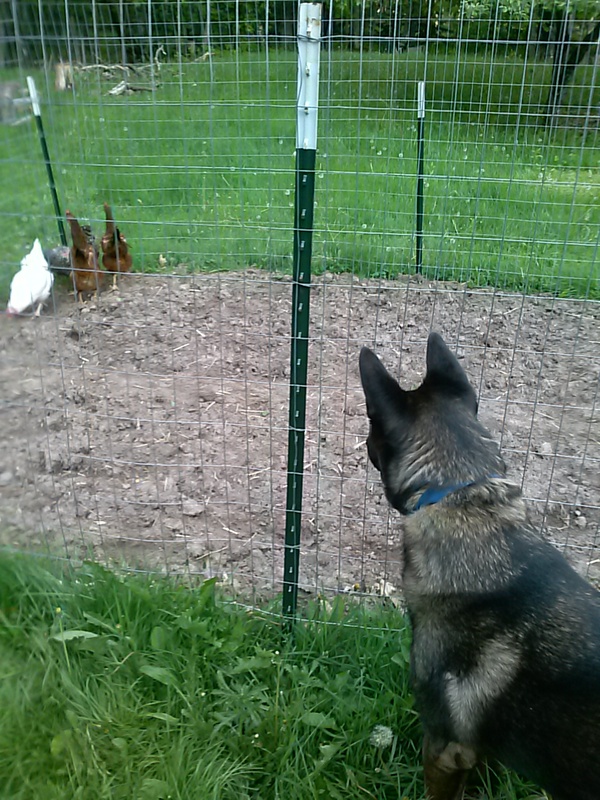 My husband said it got better later during the day – when the dogs would come out they would just quietly watch the chickens pecking around in the dirt. 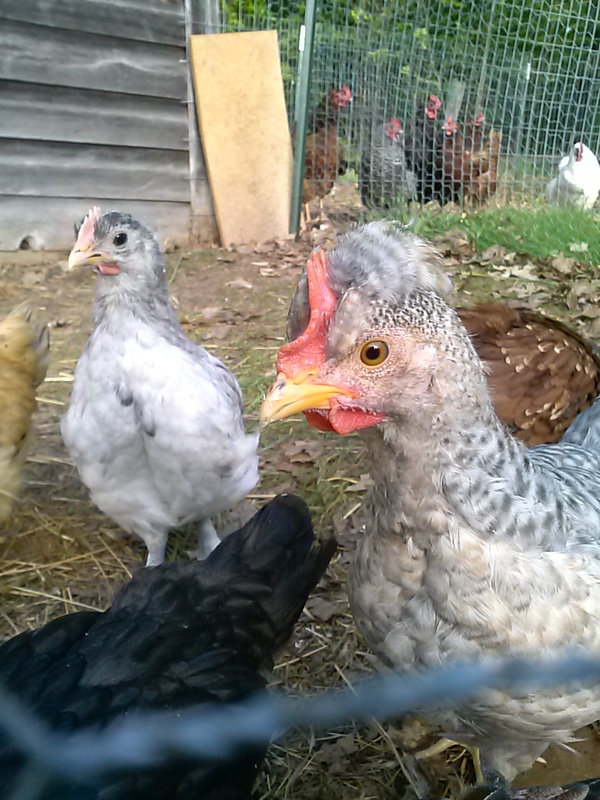 The chickens relaxed a little when they figured out the dogs couldn’t get to them. 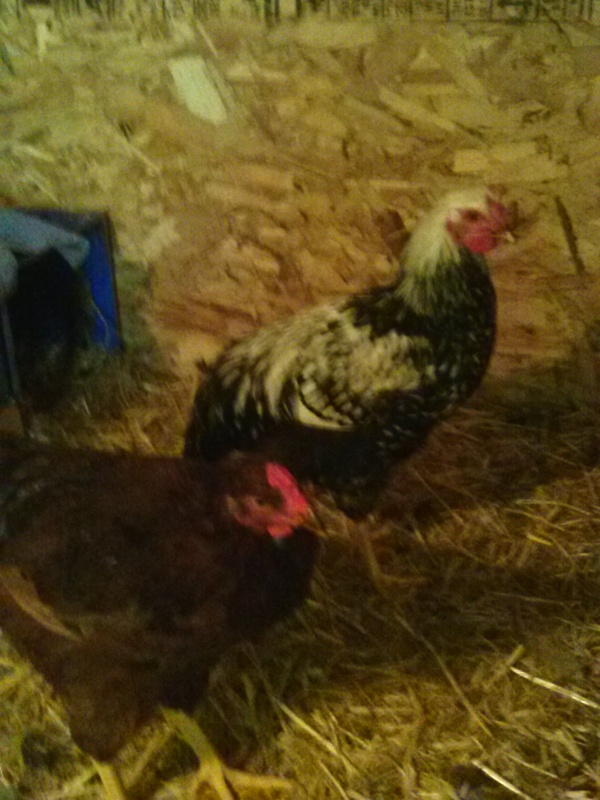 When I got home from work I put the ladies back in their own coop/run. I noticed that the pecking order in the coop was a little different before the hens were put back. 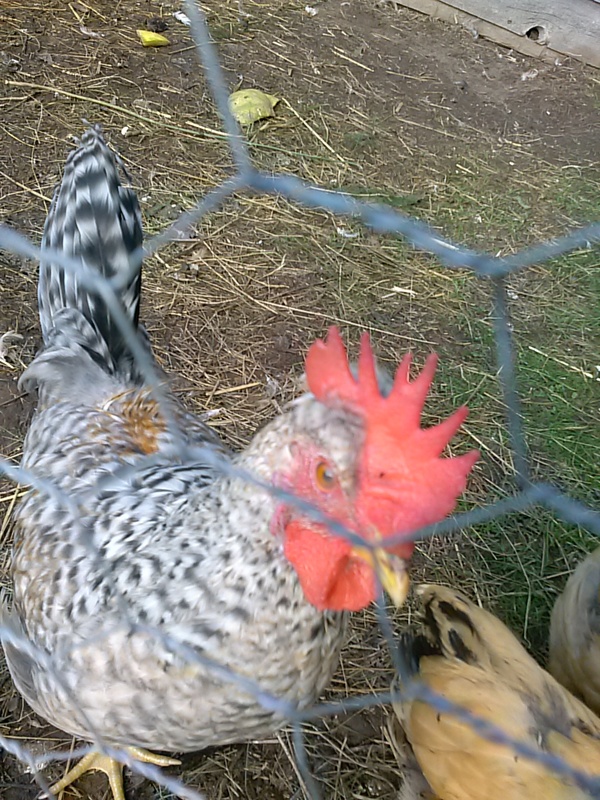 Moving four hens to the garden gave the teenagers an advantage against the hens. 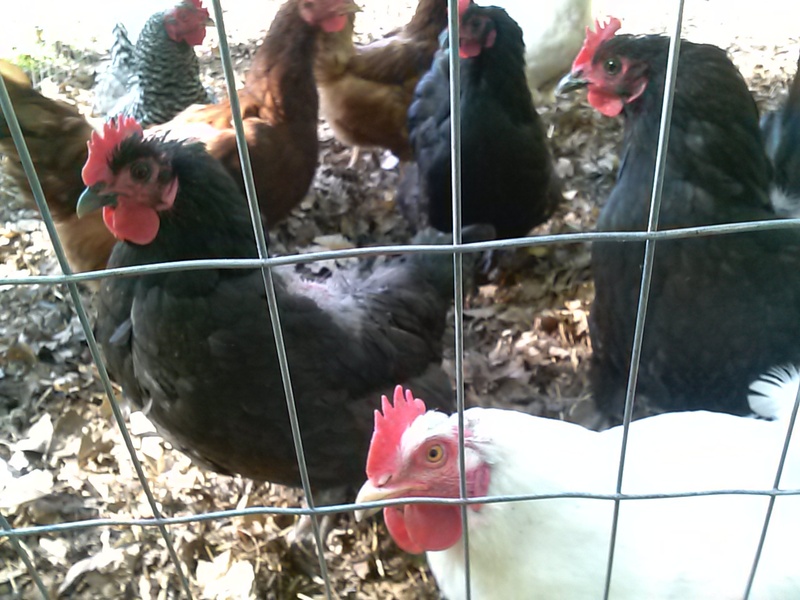 Six teens to five hens – my teenagers seem a little more aggressive, which I take as a positive sign; they’ve been so scared of the hens until now – I saw one of my teens run up and peck a hen, instead of cowering when she walked by, which is what they usually do. The pecking order will shift a bit for awhile I bet, until they all get used to each other and figure out their places. 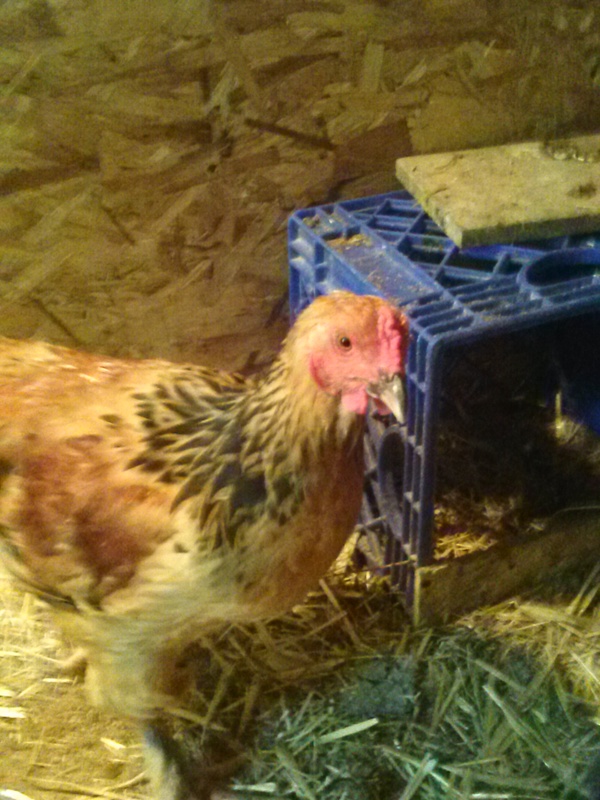 That will probably be just in time for me to introduce the babies into the flock.